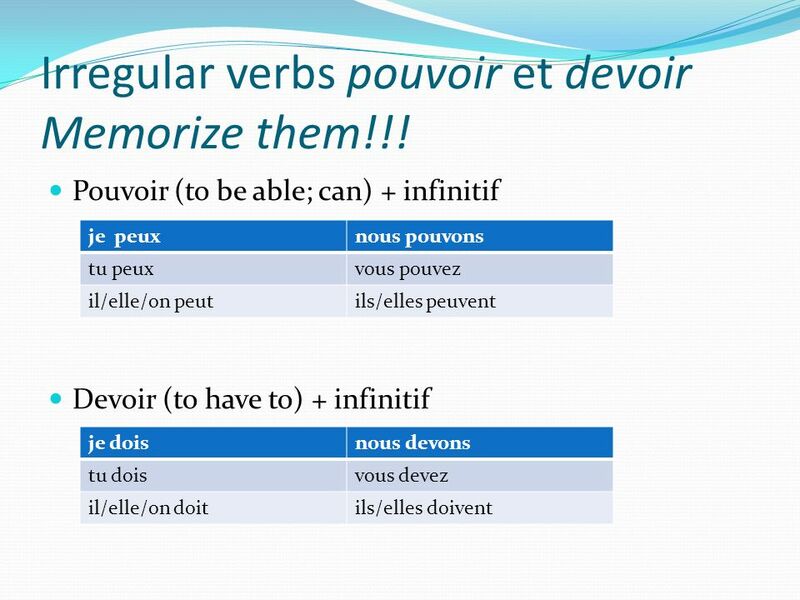 2 Irregular verbs pouvoir et devoir Memorize them!!! 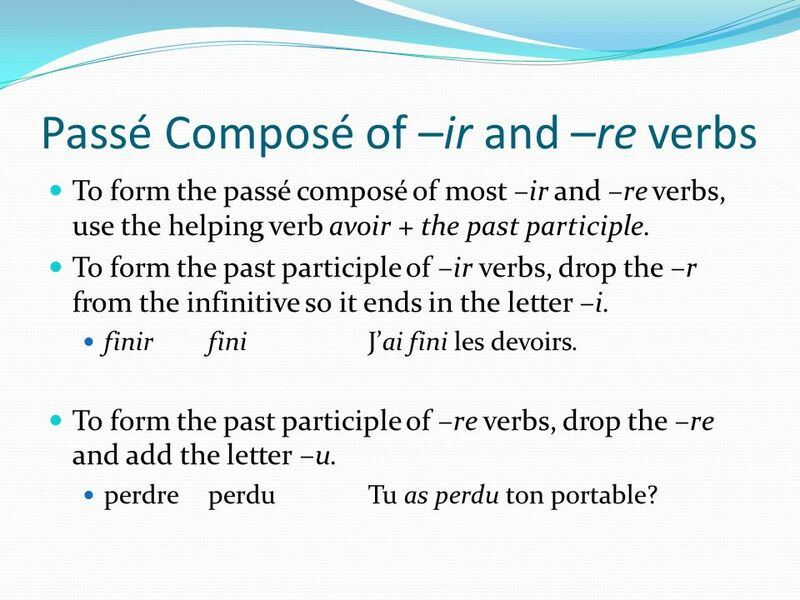 To form the passé composé of most –ir and –re verbs, use the helping verb avoir + the past participle. To form the past participle of –ir verbs, drop the –r from the infinitive so it ends in the letter –i. finir	fini	J’ai fini les devoirs. To form the past participle of –re verbs, drop the –re and add the letter –u. perdre	perdu	Tu as perdu ton portable? 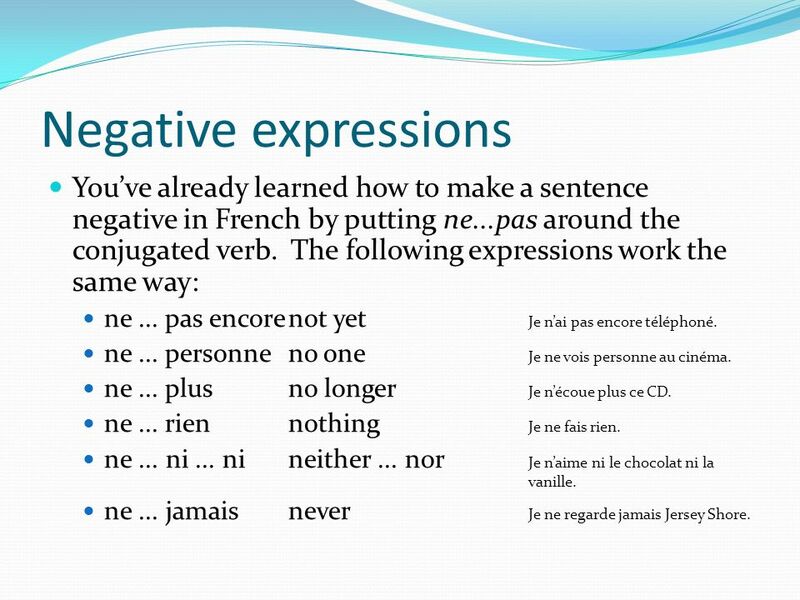 4 Negative expressions You’ve already learned how to make a sentence negative in French by putting ne...pas around the conjugated verb. The following expressions work the same way: ne ... pas encore	not yet	Je n’ai pas encore téléphoné. ne ... personne no one	Je ne vois personne au cinéma. ne ... plus	no longer	Je n’écoue plus ce CD. ne ... rien	nothing	Je ne fais rien. ne ... ni ... ni	neither ... nor	Je n’aime ni le chocolat ni la vanille. ne ... jamais	never	Je ne regarde jamais Jersey Shore. 5 Negative expressions Personne n’a joué avec moi au parc. 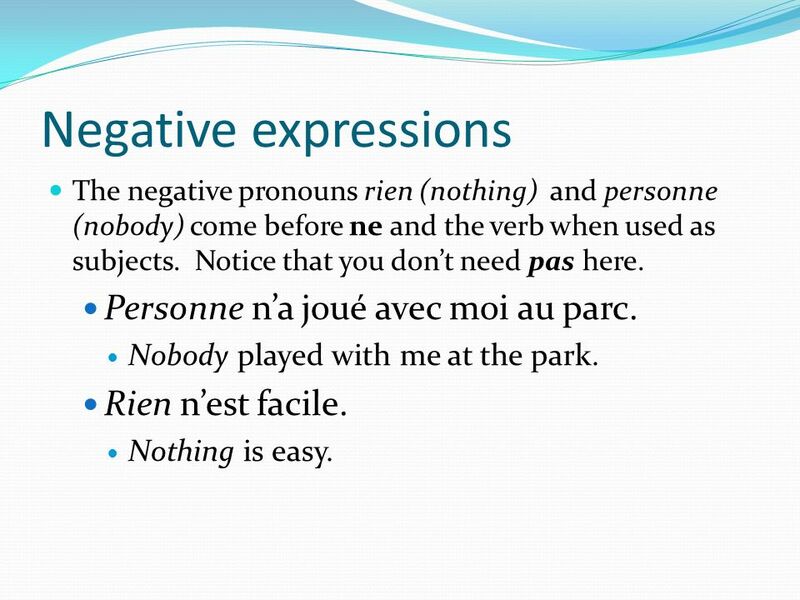 The negative pronouns rien (nothing) and personne (nobody) come before ne and the verb when used as subjects. Notice that you don’t need pas here. Personne n’a joué avec moi au parc. Nobody played with me at the park. Rien n’est facile. Nothing is easy. 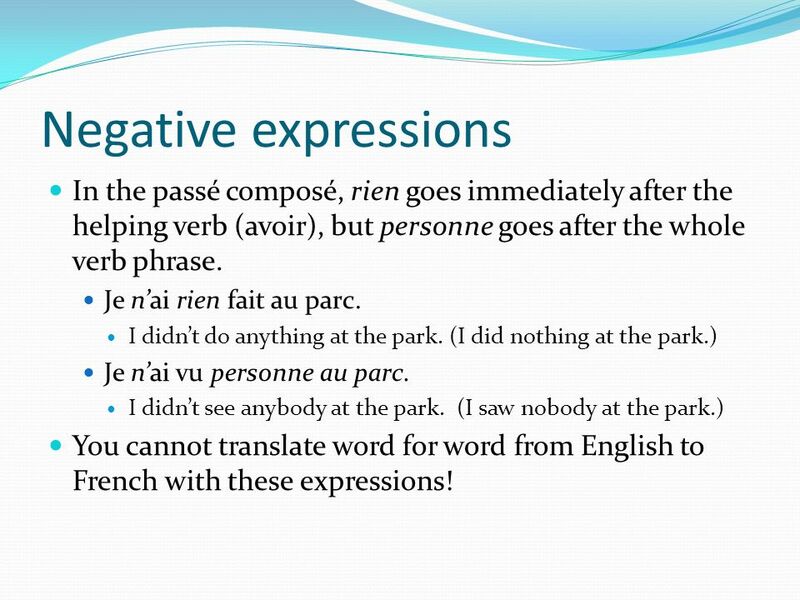 6 Negative expressions In the passé composé, rien goes immediately after the helping verb (avoir), but personne goes after the whole verb phrase. Je n’ai rien fait au parc. I didn’t do anything at the park. (I did nothing at the park.) Je n’ai vu personne au parc. I didn’t see anybody at the park. (I saw nobody at the park.) You cannot translate word for word from English to French with these expressions! 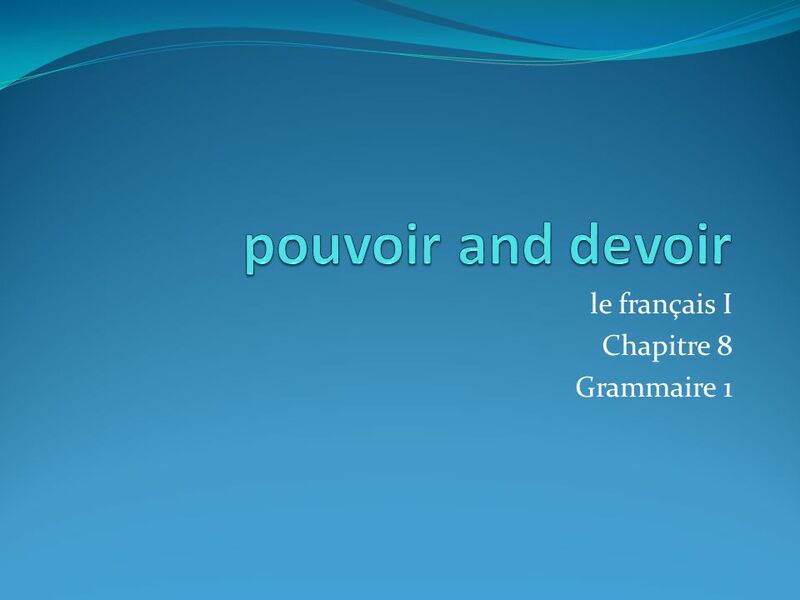 Télécharger ppt "le français I Chapitre 8 Grammaire 1"
A Les pronoms compléments me, te, nous, vous p. 388 In the sentences below, the pronouns in heavy print are called OBJECT PRONOUNS. Note the form and. La Négation Français II. Definitions ne… pasnegates a sentence ne… jamaisnever ne… riennothing ne… personneno one. Chapitre 5 Structure. Aller The verb aller (to go) is an irregular verb. Study the following forms. ALLER vais vas j tu il/elle/onva nous allons vous.